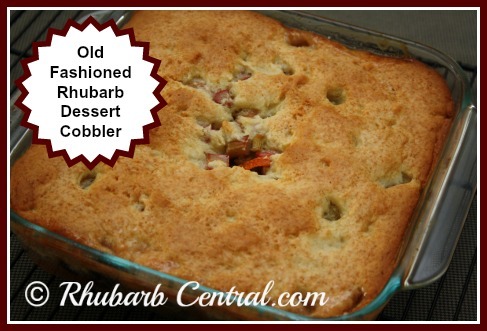 This Old Fashioned Recipe for a Rhubarb Dessert makes a yummy rhubarb dessert, a rhubarb cobbler type of dessert, in a 8" x 8" dish for 6 - 8 people using fresh picked rhubarb. The pairing of rhubarb, raisins, and refreshing orange zest make this a welcoming finale to any dinner. 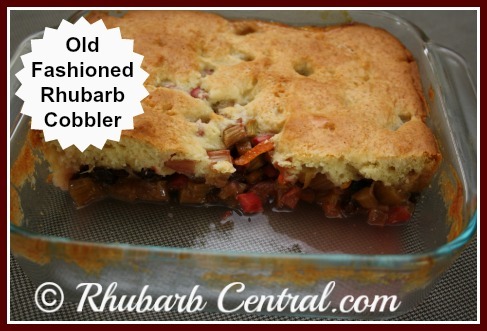 This rhubarb dessert is somewhat more tart than a plain rhubarb cobbler -- reminds me of an Old Fashioned Rhubarb Cobbler that Grandmother used to make! 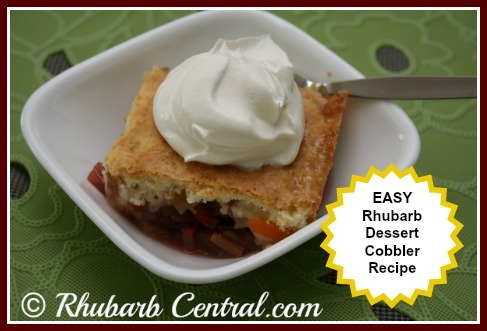 If you prefer a "sweeter" rhubarb dessert, then check out the rhubarb cobblers, crisps and crumbles here. Best served warm topped with a dollop of whipped cream or ice cream! 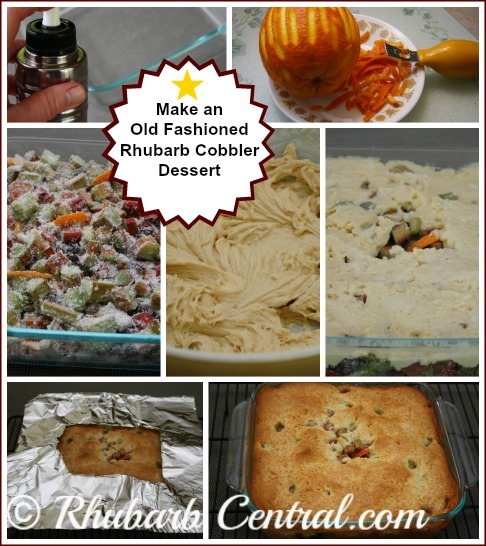 In a bowl, combine the rhubarb, 1 cup of the sugar, the raisins, and the orange rind, toss to coat, and transfer to a greased 8" x 8" baking dish. I like to use my refillable Oil Mist Bottle using olive oil (similar to the one at right or below, available at Amazon). I find it's a healthier choice than using purchased "Non Stick Cooking Spray". In a large bowl, beat, with an electric mixer, the butter and the remaining 1/3 cup of sugar until creamy. Add the egg and beat in well. In a small bowl, combine the flour, baking powder and salt. Combine the milk and the vanilla in a cup. Add the dry (flour) mixture to the egg mixture, alternately with the milk mixture, stirring to blend after each addition. Spoon the batter on top of the rhubarb, spreading evenly and leaving a small, uncovered space in the middle. Bake at 350° F for 1 hour, or until the rhubarb is tender and the topping is set and browned. Note - check the dessert after it has been baking for about 40 minutes, and if the edges are becoming too dark, make a simple shield using foil paper for the remaining baking time. (See Also: How to Make a Pie Crust Shield). Best served warm with whipped cream or ice cream on top!